One Perfect Little Miracle: Cautionary Tales. Quite a number of years ago I discovered a writer that struck a chord in this, then, young mother. His name? 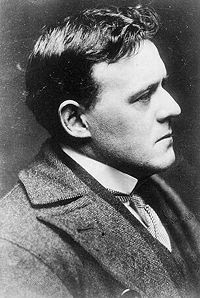 Hilaire Belloc. Born in the year 1870 in La-Celle-Saint-Cloud, France, he moved to England as a young boy with his widowed mother, and remained there for the rest of his life. He died in 1953. He was also the father of five children who were left motherless after Hilaire's wife died of influenza in 1914. A prolific writer, his legacy consists of travel literature, essays and poetry. But I think his most crowning achievement must be his Cautionary Tales for Children, perhaps the result of his having to raise five children alone. Oh, the wit! The brazen, daring boldness to put on paper such profound truths- children who misbehave will suffer consequences. Period. It is probably a family trait that I have inherited. My sister is possessed of the same gene. It is the one that caused the policeman to step back and let her have a go at my nephew, who had creeped out of the house, stolen her car and went on a joy ride with his friend. (Resulting in them running up over a curb and causing $6200 worth of damage.) After she had finished, the policeman could only say to my now terrified nephew, "I hope you listened to your mother. You have just committed the worst crime you could have done- stealing away your parent's trust. " Truer words were never spoken. I don't want this to be a preachy post. Nope, it's just that a few things have happened lately that brought these poems back to the forefront of my brain. I am including my favorite Cautionary Tale here for you. I hope you like it. *- Yes, a seagull hit my son in the head on Sunday. See? I told you. What goes around comes around... and around... and around... and around. Good grief! (There's that oxymoron, again.) What a poem. I'm going to go immediately to my favorite book seller and see if I can get a copy...what a hoot! Hope your son's head is okay...seagulls...aacck!! Oh, my word verification today is 'petinest'...as in, "She's the petinest human we've ever seen! "...from my dogs! Ha! This is a fantastic poem! I shall share it with my children in the morning as they have school - but starting two hours late. It will make for a great morning conversation and lesson.